Justice for Crown Workers in Canada and Turkey – An international campaign for basic rights for the workers at the operations of Crown Holdings Inc. in Canada and Turkey gathers steam. Bangladesh Safety Accord Publishes Unprecedented Wealth of Factory Data – Nearly 1,600 factories and more than 2 million workers are covered by the Accord, with new signers still to disclose their factories. Somali Unions Face Intimidation, Death Threats and Bombs – The harsh reality of organising workers in Somalia was vividly shown in September, when the ITUC-affiliated Federation of Somali Trade Unions, FESTU, discovered a bomb buried at the entrance gate of the union headquarters in Mogodishu. Probably placed the previous night, the bomb was the latest attempt to intimidate the union. 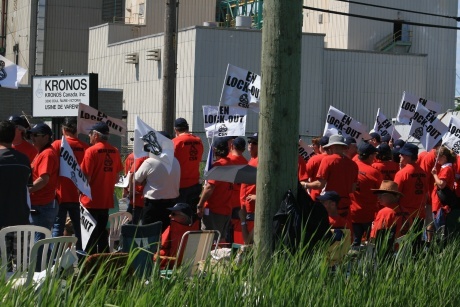 Workers Denounce Illegal Lockout at Kronos in Canada – 320 workers locked out since June 2013 at the Kronos Canada Inc. factory in Varennes, Quebec, gathered together with their families on 20 of September 2013 to denounce once again the intransigence of their employer. Peruvian Miners’ Federation Holds Two-Day Strike – Miners held a two-day strike on 26/27 September in defence of their pension rights. October 3, 2013: An international campaign for basic rights for the workers at the operations of Crown Holdings Inc. in Canada and Turkey gathers steam. IndustriALL Global Union, its North American affiliate (United Steelworkers) USW and Turkish affiliate Birle?ik Metal-?? are campaigning to stop Crown Holding’s attacks against workers with the support of Unite the Union of the UK, the International Association of Machinists (IAMAW) of North America, Crown’s European Works Council and IndustriALL’s sister global union IUF. Crown Holdings, is one of the biggest metal container companies in the world producing cans for beverage and food products in 149 countries. Despite almost doubling profits in 2012 the company prefers to race for bigger profits at any cost including at the expense of its own workers who build its wealth. During recent negotiations of the new collective agreement between Crown and USW Local 9176 in Toronto, Ontario, the company arrogantly demanded to impose a two-tier wage schedule, remove a cost-of-living allowance, provide only minimal wage increases, and keep an already nine-year freeze on pensions. The plant in Weston, Toronto produces daily five million cans and earlier was rewarded as one the best production sites in North America. Disappointed with the treatment despite their achievements and hard work the 130 USW members of the Weston site were not left any choice, but to start a strike in response to the company unjust protracted campaign aimed to lower wages and undermine working conditions. Similarly, Crown Holdings is also conducting a clear union-busting campaign against workers, who are members of IndustriALL affiliate, Birlesik Metal-Is, at its operations in Turkey since early 2012. After many difficulties in the recruitment period, Birle?ik Metal-? ?, in November 2012, managed to obtain a collective bargaining certificate from the Ministry of Labour confirming that it is eligible to be a party for negotiations. However, as widely used tactics by employers in Turkey in order to destroy union organizing, Crown immediately challenged the certification at local labour court for stalling the process. In the meantime, IndustriALL’s sister organization IUF challenged major customers of Crown in the brewery sector since there have been clear violations of fundamental rights in the company’s operations in Turkey. As part of the international campaign, three demonstrations will be organized to protest the on-going conflicts at the Crown plants: the first one will be held on 16 October in Philadelphia, U.S. where the company is headquartered; the second, on 18 October is in Baar, Switzerland, where the company’s European headquarters is located; and the third will be in Turkey on 21 October. In the meantime, a USW and LabourStart have launched a joint campaign page. To send online message of protest to the Crown Holdings CEO John Conway in support of the workers in Canada and Turkey, click on the link below: http://www.labourstartcampaigns.net/show_campaign.cgi?c=1978. he Accord on Fire and Building Safety in Bangladesh today made public a list of nearly 1,600 factories covered by the pact, employing more than 2 million workers. The list includes information, pertinent to assessing building safety, some of which has never previously been disclosed in the apparel industry. The Accord on Fire and Building Safety in Bangladesh is a legally binding agreement between apparel brands and retailers and trade unions. It has been signed by over 90 apparel corporations from 19 countries in Europe, North America, Asia and Australia; two global labor federations, IndustriALL and UNI; and numerous Bangladeshi unions. Clean Clothes Campaign, Workers’ Rights Consortium, and International Labor Rights Forum are NGO witnesses to the Accord. The International Labour Organisation (ILO) acts as the independent chair. The Accord also indicated today that it will announce in the coming days the hiring of the Chief Safety Inspector who will oversee the initiative’s factory inspection and renovation program. The Accord will launch a new website on Monday 7th October, on which the factory data — sent today to journalists and key stakeholders — will be posted for easy public access. The website will also include additional information on the ongoing progress and operational work of the Accord, including a detailed Q&A section. Regular Accord updates will be found on Twitter by following @bangaccord as of the 7th of October. Visit the website of the Accord on Fire and Building Safety here. October 1, 2013: The harsh reality of organising workers in Somalia was vividly shown in September, when the ITUC-affiliated Federation of Somali Trade Unions, FESTU, discovered a bomb buried at the entrance gate of the union headquarters in Mogadishu. Probably placed the previous night, the bomb was the latest attempt to intimidate the union. FETSU’s ten affiliated trade unions participated at the meeting on 28 September, which was held at the federation’s head office in Mogadishu. The meeting had been called to exchange views and consult about the increasing number of threats and attempts to destabilize the federation. Politically motivated, the attacks, including specific death threats, appear to be intended to intimidate and threaten FESTU and its elected leadership. The very real threat under which trade unions in Somalia operate was made blatantly clear with the discovery of a bomb planted outside the headquarters. The bomb was subsequently removed without any damage and handed over to the police. Despite the bomb, the meeting went ahead and the unions unanimously agreed to a declaration. Protests have been lodged with the Federal Police Commissioner, the Prime Minister of Somalia and the Minister of Interior & National Security. At present, IndustriALL Global Union has no affiliated trade unions in Somalia, but is in detailed discussions with FETSU over the creation of a new oil and gas workers union. FESTU is the first independent and democratic trade union centre in the country, and the current situation highlights the importance to assist them in their struggles. IndustriALL Global Union join the call of FESTU and its member unions, that all people unite against the elements behind these attacks, as well as on the government to take decisive action to protect the people. The unions have pledged to campaign to the last ounce of their energies against on-going intimidation and harassment of labour leaders and members. IndustriALL Global Union strongly commends and salutes their determination to continue to fight for workers rights and a living wage for the workers of Somalia. October 1, 2013: 320 workers locked out since June 2013 at the Kronos Canada Inc. factory in Varennes, Québec, gathered together with their families on 20 of September 2013 to denounce once again the intransigence of their employer. 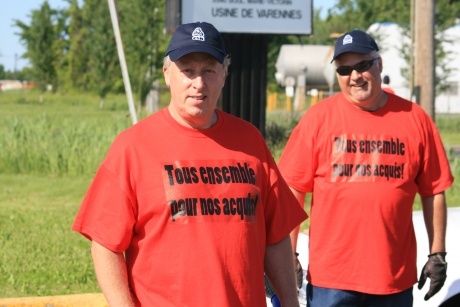 The locked-out workers are represented by the IndustriALL Canadian affiliate Fédération de l’Industrie Manufacturière de la Confédération des Syndicats Nationaux – FIM-CSN. 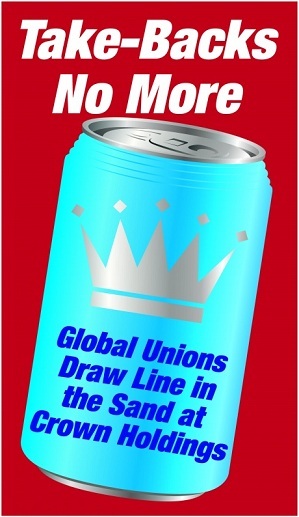 Despite the union’s readiness to discuss controversial issues the employer remains stubbornly resistant on many of its initial positions including the massive use of a subcontracted workforce, elimination of 30 per cent of the jobs, serious changes in the work schedule, overtime work and restructuring of the workforce, destruction of the pension system, and the weakening of trade union freedoms. Brian Kohler, IndustriALL Global Union’s Contact for North America region addressed the gathering with a speech of support and admiration for the courageous struggle of Kronos workers and their families. The message of support from IndustriALL was especially appreciated in the light of the slow pace of negotiations with the Kronos management despite facilitation by a conciliator since the beginning of the lockout. Despite the lockout, Kronos Canada still continues production by resorting to the work of managers, routinely accompanied by security guards. The locked-out workers are bound by various injunctions, including a limitation of the number of pickets near the factory. Kronos Canada, Inc., is a subsidiary of Kronos Worldwide, Inc. engaged in the production and marketing of titanium dioxide pigments (TiO2) primarily in Europe and North America. October 3, 2013: Miners held a two-day strike on 26/27 September in defence of their pension rights. Unions in the Peruvian Miners’ Federation (Federación Minera de Perú, FNTMMSP), which is affiliated to IndustriALL Global Union, went on strike for the first time since October 2009, in support of demands for the repeal of a government decree that will reduce payments from a supplementary pension scheme by extending benefits to sectors that have not contributed to the fund. The FNTMMSP added that the decree made a further change by stipulating that workers will be paid annually rather than monthly. The Peruvian government introduced the supplementary pension scheme in 2012. Mining companies contribute 0.5 per cent of their income and workers contribute 0.5% of their gross wages. Unions at Southern Copper’s Toquepala mine and at mines owned by Buenaventura and Shougang participated in the strike.